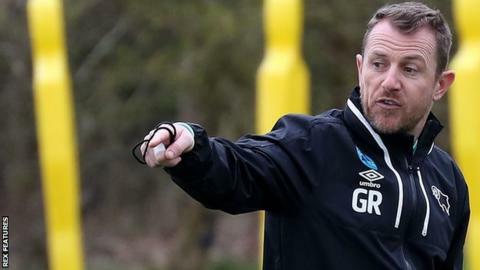 Derby manager Gary Rowett still wants more from his Championship side despite a fourth home win in five games. The Rams beat Sheffield Wednesday 2-0 on Saturday to go ninth in the table. "I am not overly happy and I think we can do a lot better, but it's another clean sheet and another win," Rowett told BBC Radio Derby. "We have to be better when not in possession. I thought our energy to win back the ball was poor and we have to do that side of the game much better." Derby are now only three points off the play-offs after successive 2-0 home wins over fierce rivals Nottingham Forest and the Owls. Rowett's side have also thumped Hull and scraped past Preston at Pride Park to go with a draw against Birmingham and 2-0 defeat by Wolves in August. But their away form has been a stumbling block with just one win on the road all season. "My concern is, as a manager, is that if you allow bad habits to develop, at some point they are going to bite you on the backside and you will lose a game or two because of it," Rowett continued. "We weren't god enough with the ball and we didn't open pockets up. We didn't play with enough quality, especially in the final third. "A side like Sheffield Wednesday are always dangerous and they created too many chances for my liking - and I felt they should have had a penalty as well. "I am disappointed but we are starting to build quite nicely and that's a good disappointment to have."